Given that the goal of this article is to introduce you to the Linux kernel and explore its architecture and major components, let’s start with a short tour of Linux kernel history, then look at the Linux kernel architecture from 30,000 feet, and, finally, examine its major subsystems. The Linux kernel is over six million lines of code, so this introduction is not exhaustive. Use the pointers to more content to dig in further. You’ve probably noticed that Linux as an operating system is referred to in some cases as “Linux” and in others as “GNU/Linux.” The reason behind this is that Linux is the kernel of an operating system. The wide range of applications that make the operating system useful are the GNU software. For example, the windowing system, compiler, variety of shells, development tools, editors, utilities, and other applications exist outside of the kernel, many of which are GNU software. For this reason, many consider “GNU/Linux” a more appropriate name for the operating system, while “Linux” is appropriate when referring to just the kernel. While Linux is arguably the most popular open source operating system, its history is actually quite short considering the timeline of operating systems. In the early days of computing, programmers developed on the bare hardware in the hardware’s language. The lack of an operating system meant that only one application (and one user) could use the large and expensive device at a time. Early operating systems were developed in the 1950s to provide a simpler development experience. Examples include the General Motors Operating System (GMOS) developed for the IBM 701 and the FORTRAN Monitor System (FMS) developed by North American Aviation for the IBM 709. In the 1960s, Massachusetts Institute of Technology (MIT) and a host of companies developed an experimental operating system called Multics (or Multiplexed Information and Computing Service) for the GE-645. One of the developers of this operating system, AT&T, dropped out of Multics and developed their own operating system in 1970 called Unics. Along with this operating system was the C language, for which C was developed and then rewritten to make operating system development portable. Twenty years later, Andrew Tanenbaum created a microkernel version of UNIX®, called MINIX (for minimal UNIX), that ran on small personal computers. This open source operating system inspired Linus Torvalds’ initial development of Linux in the early 1990s (see Figure 1). Linux quickly evolved from a single-person project to a world-wide development project involving thousands of developers. One of the most important decisions for Linux was its adoption of the GNU General Public License (GPL). Under the GPL, the Linux kernel was protected from commercial exploitation, and it also benefited from the user-space development of the GNU project (of Richard Stallman, whose source dwarfs that of the Linux kernel). This allowed useful applications such as the GNU Compiler Collection (GCC) and various shell support. Now on to a high-altitude look at the GNU/Linux operating system architecture. You can think about an operating system from two levels, as shown in Figure 2. In reality, the architecture is not as clean as what is shown in Figure 2. For example, the mechanism by which system calls are handled (transitioning from the user space to the kernel space) can differ by architecture. Newer x86 central processing units (CPUs) that provide support for virtualization instructions are more efficient in this process than older x86 processors that use the traditional int 80h method. At the top is the user, or application, space. This is where the user applications are executed. Below the user space is the kernel space. Here, the Linux kernel exists. There is also the GNU C Library (glibc). This provides the system call interface that connects to the kernel and provides the mechanism to transition between the user-space application and the kernel. This is important because the kernel and user application occupy different protected address spaces. And while each user-space process occupies its own virtual address space, the kernel occupies a single address space. The Linux kernel can be further divided into three gross levels. 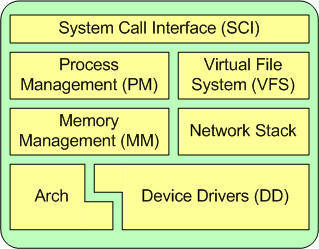 At the top is the system call interface, which implements the basic functions such as read and write. 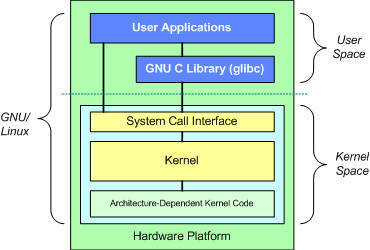 Below the system call interface is the kernel code, which can be more accurately defined as the architecture-independent kernel code. This code is common to all of the processor architectures supported by Linux. Below this is the architecture-dependent code, which forms what is more commonly called a BSP (Board Support Package). This code serves as the processor and platform-specific code for the given architecture. When discussing architecture of a large and complex system, you can view the system from many perspectives. One goal of an architectural decomposition is to provide a way to better understand the source, and that’s what we’ll do here. The Linux kernel implements a number of important architectural attributes. At a high level, and at lower levels, the kernel is layered into a number of distinct subsystems. Linux can also be considered monolithic because it lumps all of the basic services into the kernel. This differs from a microkernel architecture where the kernel provides basic services such as communication, I/O, and memory and process management, and more specific services are plugged in to the microkernel layer. Each has its own advantages, but I’ll steer clear of that debate. Over time, the Linux kernel has become efficient in terms of both memory and CPU usage, as well as extremely stable. But the most interesting aspect of Linux, given its size and complexity, is its portability. Linux can be compiled to run on a huge number of processors and platforms with different architectural constraints and needs. One example is the ability for Linux to run on a process with a memory management unit (MMU), as well as those that provide no MMU. The uClinux port of the Linux kernel provides for non-MMU support. Now let’s look at some of the major components of the Linux kernel using the breakdown shown in Figure 3 as a guide. The SCI is a thin layer that provides the means to perform function calls from user space into the kernel. As discussed previously, this interface can be architecture dependent, even within the same processor family. The SCI is actually an interesting function-call multiplexing and demultiplexing service. You can find the SCI implementation in ./linux/kernel, as well as architecture-dependent portions in ./linux/arch. 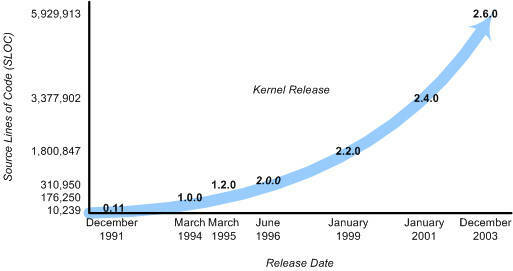 As shown in Figure 3, a kernel is really nothing more than a resource manager. Whether the resource being managed is a process, memory, or hardware device, the kernel manages and arbitrates access to the resource between multiple competing users (both in the kernel and in user space). Also in process management is the need to share the CPU between the active threads. The kernel implements a novel scheduling algorithm that operates in constant time, regardless of the number of threads vying for the CPU. This is called the O(1) scheduler, denoting that the same amount of time is taken to schedule one thread as it is to schedule many. The O(1) scheduler also supports multiple processors (called Symmetric MultiProcessing, or SMP). You can find the process management sources in ./linux/kernel and architecture-dependent sources in ./linux/arch). Another important resource that’s managed by the kernel is memory. For efficiency, given the way that the hardware manages virtual memory, memory is managed in what are called pages (4KB in size for most architectures). Linux includes the means to manage the available memory, as well as the hardware mechanisms for physical and virtual mappings. If the portability and efficiency of the Linux kernel weren’t enough, it provides some other features that could not be classified in the previous decomposition. Linux, being a production operating system and open source, is a great test bed for new protocols and advancements of those protocols. Linux supports a large number of networking protocols, including the typical TCP/IP, and also extension for high-speed networking (greater than 1 Gigabit Ethernet [GbE] and 10 GbE). Linux also supports protocols such as the Stream Control Transmission Protocol (SCTP), which provides many advanced features above TCP (as a replacement transport level protocol). Linux is also a dynamic kernel, supporting the addition and removal of software components on the fly. These are called dynamically loadable kernel modules, and they can be inserted at boot when they’re needed (when a particular device is found requiring the module) or at any time by the user. A recent advancement of Linux is its use as an operating system for other operating systems (called a hypervisor). 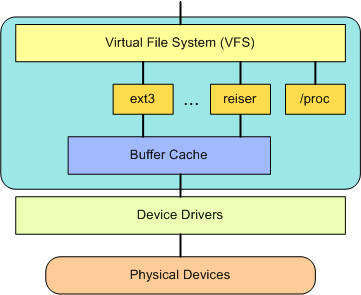 Recently, a modification to the kernel was made called the Kernel-based Virtual Machine (KVM). This modification enabled a new interface to user space that allows other operating systems to run above the KVM-enabled kernel. In addition to running another instance of Linux, Microsoft® Windows® can also be virtualized. The only constraint is that the underlying processor must support the new virtualization instructions. This article just scratched the surface of the Linux kernel architecture and its features and capabilities. You can check out the Documentation directory that’s provided in every Linux distribution for detailed information about the contents of the kernel.